M48 OPS Military Law Enforcement Tactical Self Defense Gloves - Black - Large | BUDK.com - Knives & Swords At The Lowest Prices! 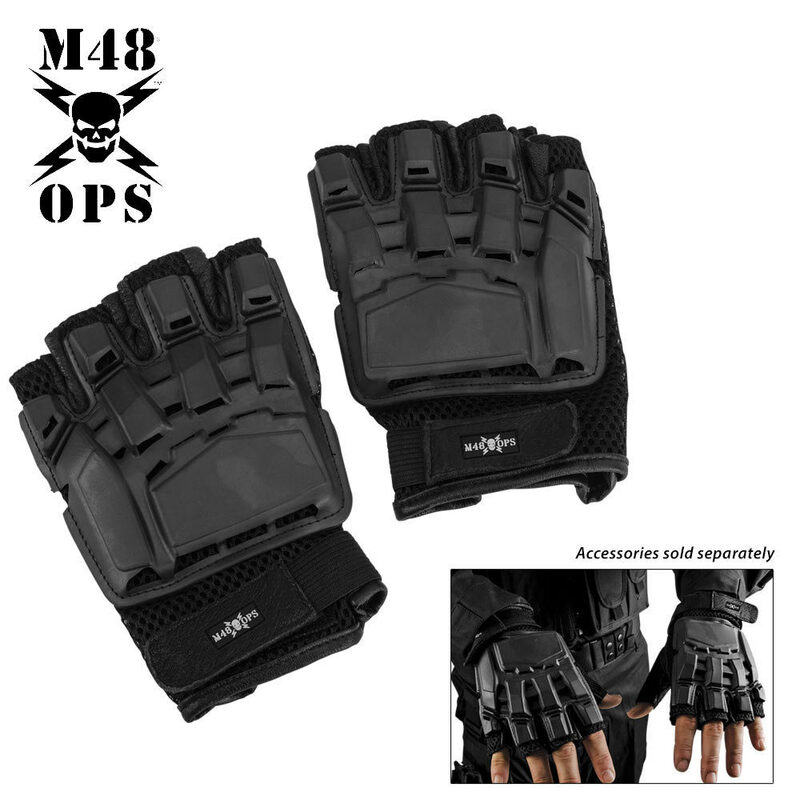 Add some more knockout power to your punch with these M48 OPS military-style tactical self-defense gloves! These quality tactical gloves feature a combination of leather, polyurethane and mesh nylon construction in a half-finger design. 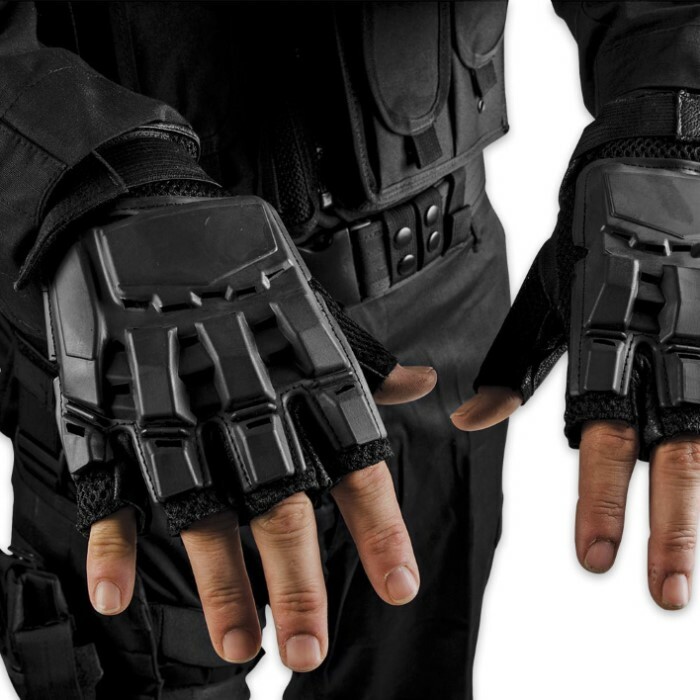 Perfect for law enforcement, security guards and military personnel, these gloves will add some power to your punch and protect your knuckles. Pros: look intimidating, good for paintball. Con: the plastic back pieces dig into your hand when throwing a punch. Cool, but not very comfortable. I bought these some time ago, mostly due to their looks. A hard-backed glove? What could go wrong? Well, I'll tell you; first, the velcro wears down unnecessarily fast, and second, the plastic covering on the back of the glove would grind against my knuckles whenever I would go to make a fist. Thankfully I never made my knuckles raw doing so, but still. 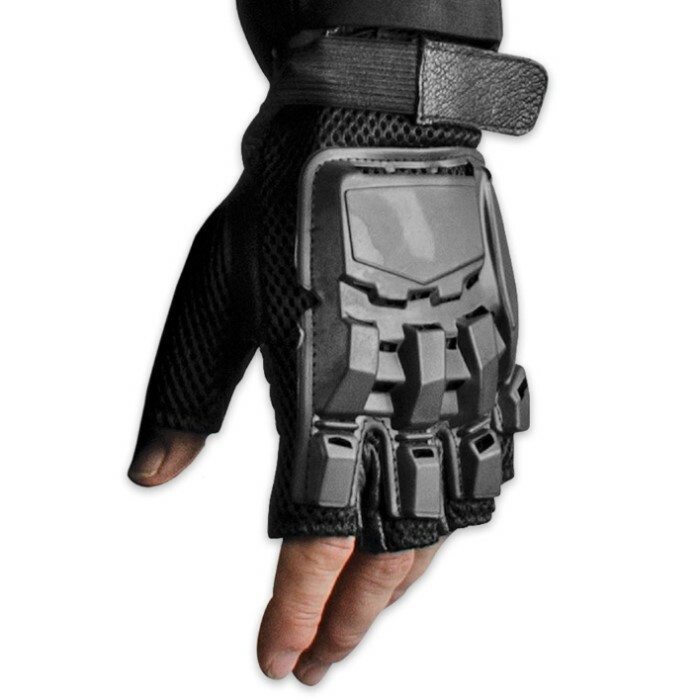 The most I can see use for these would be in, say, airsoft or paintball, but you wear something on your knuckles to keep them from going raw. Other than that, I'd say look for something else. I got these about a month ago and wanted to put them to the test before I wrote a review on them. These things are very awesome for the price. I will say though that they can be a little uncomfortable around the knuckles because of the hard material at first, so you have to break them in a bit to get the feel for them, but after that, they aren't so bad. I will be purchasing the other tactical M48 gloves soon to discern the difference. As for these puppies, you wont be disappointed. Great protection and handling. These gloves are GREAT. I absolutely love them. The three fabrics they use are high quality. Once they are broken in you'll forget they are on....until the Velcro begins desintigrating. Which will probably happen within a week. I don't understand why someone would go through such lengths to make such great gloves, then use the lowest quality Velcro I've ever seen in my life. Seriously, where did they even GET this Velcro from? I didn't use these gloves for anything special. Just for looks. I didn't even adjust them a lot. The Velcro just started falling apart. Five stars.